After a hard day of canning fruit at Dole and a hard night of typesetting my eventually forthcoming novel on my authentic, 15th-century Gutenberg press, I ended up sitting in a diner downtown last night with Sarah, who claims that I never write about her. But then again, Sarah also claims that bananas are hard to digest, which is obviously ridiculous, so you really can't completely trust everything Sarah says. Seriously, how could bananas be hard to digest? They're yellow! I think I might have to ask the other Matt Hooban - the one in England. He seems to know an awful lot about bananas. Maybe a little too much, even. But this post isn't about Sarah anyway, and it isn't about bananas either, even though I am currently devouring one in what Sarah would consider an act of self-immolation, but that I consider an act of complete yumminess. It's about the Democratic debate, which was playing on television in the background in the diner, I guess because there were no sports on. Okay, did I miss a memo? How was there a debate last night if the writers (or the Broadway stagehands, or whatever they're calling themselves this week) were on strike? Did my letter to Jesus, like so many of my letters to other world leaders and imaginary fairy tale characters, work? Is the strike settled? Are the lights back on on Broadway? Who framed Roger Rabbit? I suppose we may never know the answer to any of these questions, except the last one. It was a toon disguised as Christopher Lloyd, which brings me right back to the Democratic debate, and this very alarming video still of John Edwards, that clearly shows he is drunk. Now, let's get real, America. Is this really the kind of person you want on a stage in Nevada attacking his fellow Democrats, in defiance of the still-striking writers/Broadway stagehands? I was in Grand Central Station in New York City yesterday and I saw three soldiers lounging around in their "mass transit camo" against the ticket windows along the 42nd Street side of the main concourse. I saw three of them! And while it's entirely possible that there was an unseen force of hundreds looming elsewhere in better disguises, it still doesn't change the fact that those three soldiers, just like the six in the photo above, have been compromised. 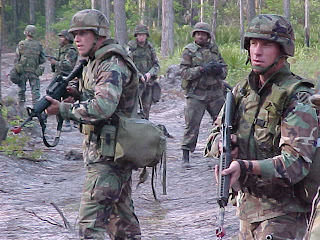 Think about this: if we were to invest a greater portion of our defense budget into developing camouflage that actually worked, then all the politicians could say, "yes, we pulled our troops out of Iraq. Go look." And then all of us would feel all bad for accusing them of lying because we wouldn't be able to see any troops in Iraq anymore, even if they were still there. Come to think of it, we could probably get by with a much smaller army too, like 20 people. I'm pretty sure that 20 people in working camouflage could achieve roughly the same level of success in Iraq that the 130,000 visible soldiers in their crappy "desert camo" have achieved. Hop to it, candidates! Pick up the banana and run with it. And if you're ever in that diner I was in last night, order the matzoh ball soup, which is an act of complete yumminess that no one - not even the Democrats - can debate. And speaking of matzoh ball soup, what's up with Barry Bonds getting indicted? * If you said "less than six," then your eyes are not working, and there was no need to read the rest of this post. If you said "more than six," then YOU ARE A LIAR. I must confess to occasionally having some sort of dietary intolerance to bananas myself. Very hard to digest. Strangely, this intolerance was born when I lived in the Rockies, lasted several years and spanned several banana-eating attempts. Now that we are in Michigan, my problem has seemingly disappeared.